Bacon Software’s Job Accounting System adds complete Invoicing, Purchasing, Payment Processing, Vendor Invoicing, Sales Commission processing and more to your Bacon Software System. • Create invoices direct from JTS. Once jobs are shipped from the Job Trac System (JTS) they become available for invoicing and can be accessed directly by JAS. 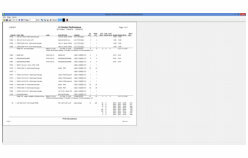 • WSIWYG invoice creation. Users my edit invoices in a “What you see is what you get” format. Complete editing includes the ability to change tax status on individual line items, modification of all standard invoice fields such as qty, description, unit price, shipping method, payment method, etc. 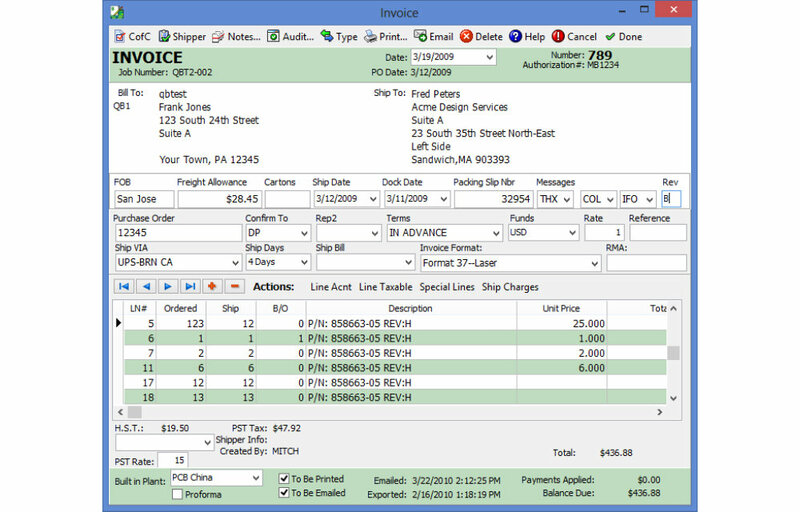 • Users may define invoice detail default lines that can be pasted in to any invoice. Default lines can include both text and priced items. • Multiple Job Invoice. 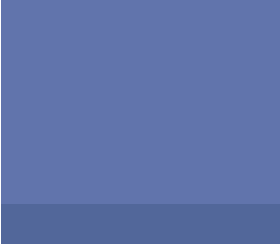 Create a single invoice for multpile jobs that you have built for a customer. • Batch Print/Email Invoices. • Complete AR Functions. Receive Customer Payments and process with discounts. • Multi-Split function. 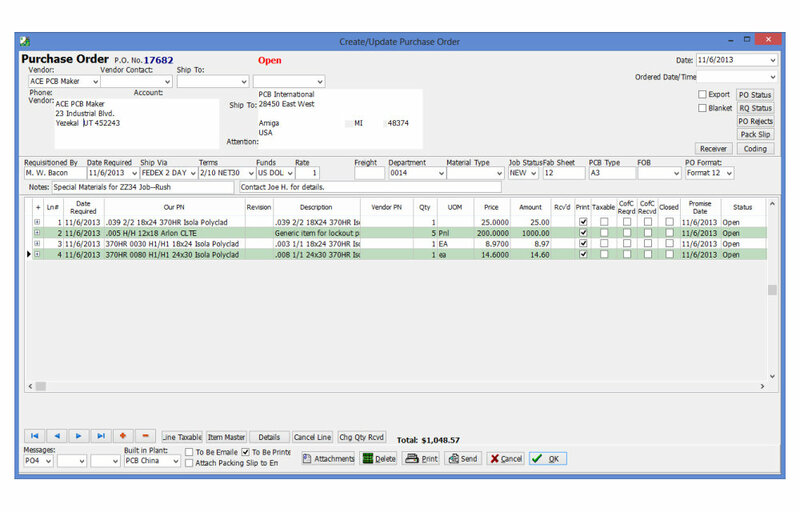 In a single transaction you can ship a job, update the stock room, move boards to stock, reject boards, designate boards to “Overs”, create an Invoice, Packing Slip and Shipping Labels. • Create RMA’s. Issue, Receive, Disposition defective material. The system generates e- mail messages automatically to notify your customers of the RMA status. 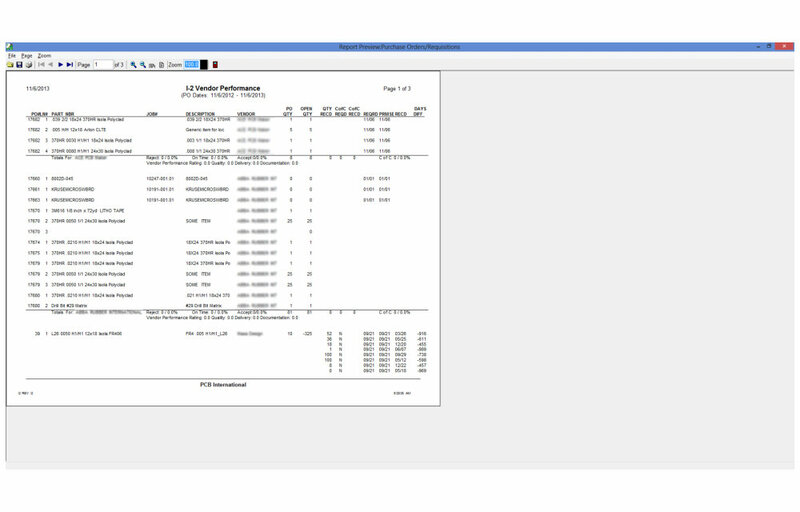 The system automatically builds Rework, Remake and Use-As-Is releases for the RMA parts. • Multiple Reports are available to help in maintaining your accounts receivables and payables. • Complete Sales Commission calculations and reports. • Complete Purchasing/Requisition functions including PO generation and material receiving. 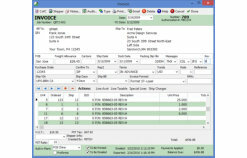 Materials received automatically update the materials system in the Job Trac System (JTS). • Links to popular account packages including QuickBooks, Peachtree, SBT, Mass-90, DataPro. Ascii export also available. Requisitions, RMA documents, multiple reports and more.